Blog » Rainbow Elf Saves the Day! Rainbow Elf Saves the Day! If, like me, you have a child who wants to do many things for their birthday party, then Rainbow Elf is your saviour! I knew I was going to probably have to go down the route of hiring a hall, doing the food but I couldn’t face entertaining 15 hyper girls doing Disco/Strictly/Craft so I needed to find someone that had the energy and patience to do this! Rainbow Elf had performed at our school Summer Fair, she was very popular and I had heard great reviews from other local North Leeds events she had done. I rang Rebecca (Rainbow Elf) up and gave her my daughters brief and she was not phased at all! I could tell straight away by her enthusiasm on the phone that she would be a huge hit with my daughter and her friends. Rebecca went away and came back with a detailed proposal which covered everything my daughter had asked for and more! This included: Disco (with on-trend music, gone are the days of nursery rhymes! 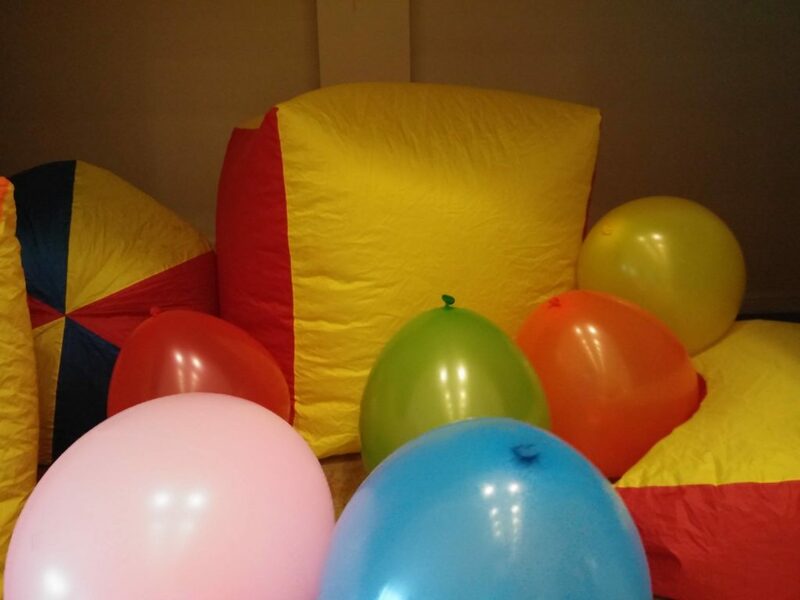 ), karaoke, bubble machine, games, balloons, dance off (including props) and craft time. I have to admit I did think how are we going to fit this into a 2-hour party and how would she get them to sit still for crafts! We hired Scarcroft village hall which is a great hall as it splits into two sections meaning we could have the disco on one side and the crafts and food on the other. 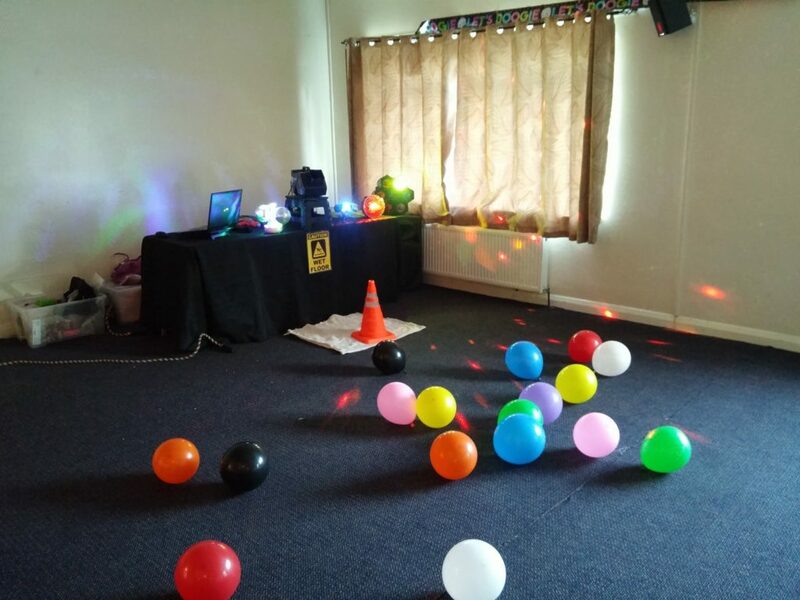 Rebecca arrived approx half an hour before the party to prepare and set up her full disco system including lights and bubble machine. 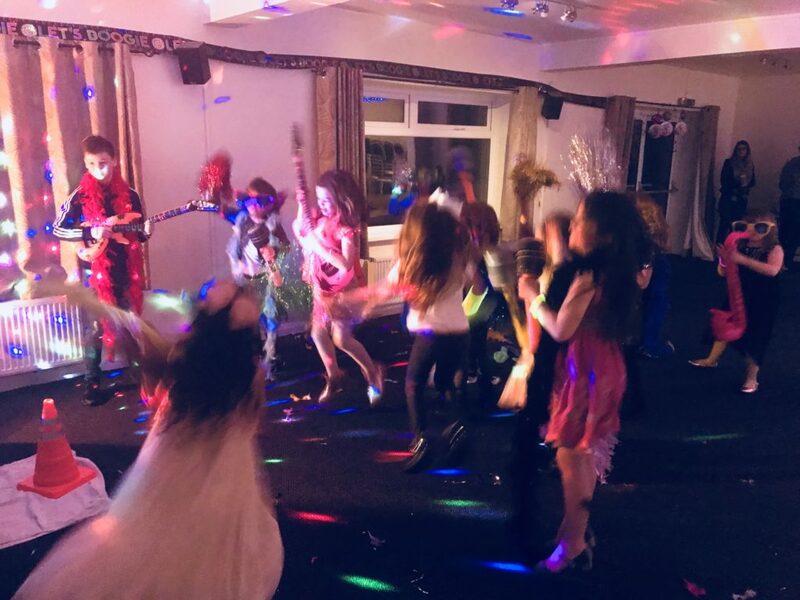 When the children arrived the disco was playing and once everyone was there they did karaoke to ‘Reach For The Stars’ and played some games. Rebecca was so enthusiastic with the children from the start and it was clear that she tailors her parties very well to the age group. 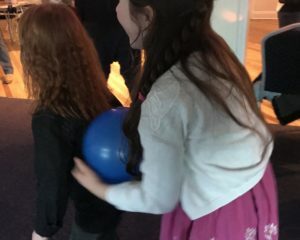 The games she played were all different to your ‘traditional’ party games and the ‘elephant’ game and the ‘nose and bottom’ game (as described by a 7-year-old) were big hits! 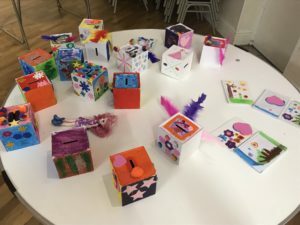 The children then went to the ‘craft corner’ and could choose to either decorate a money box or notepad. My daughter had picked these as the choices prior to the party but Rebecca had a large list of other crafts she could have picked. 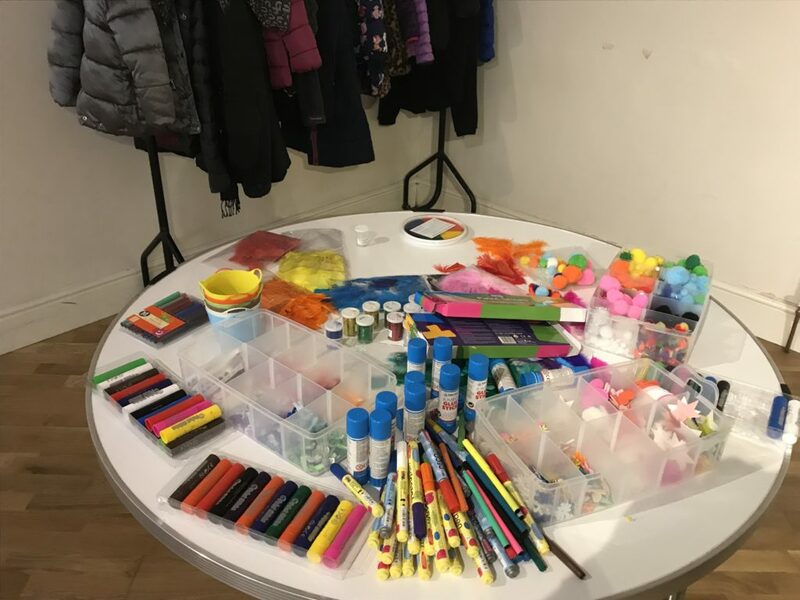 Rebecca brought all the craft materials and explained to the girls what they needed to do. I was so surprised how the girls went from basically bouncing off the walls to sitting down and crafting! The crafts brought a nice bit of calm to the party and were very popular – they could have all continued for longer. They also got to take their masterpieces home so could double up as party bag contents! After the crafts, the children had the party tea. Scarcroft village hall is really well equipped and has two ovens so we did pizzas (with Grandmas help), which reduced the party food prep needed prior to the party! After tea the children did more disco dancing, Karaoke and the bubble machine came out! It surprises me how the bubble machine remains as popular at a 7-year-olds party as it does a 1-year-olds! The party finale was the dance off!!! The girls were super excited by this, Rebecca had so many props for them to choose from including blow up guitars, microphones, hats, glasses and feather bowers! They split into two teams and had a dance/sing off. The party was a huge hit with all the children and I would definitely recommend Rebecca (Rainbow Elf) if you are looking for a party that has lots of different parts to it. She is multi-talented and enthusiastically engaged the children in all aspects of the party. It was clear to see that she truly enjoys what she does and delivers her parties in a very professional but friendly way. She told me the next day she was going to do a 2 years old party which included princesses, pirates and Elsas! She can certainly cater for all ages and themes. As well as full party entertainment Rainbow Elf can also do face painting, glitter tattoos, balloon modelling and can provide party bags. 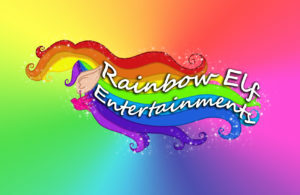 For more information on parties and all bookings call Rebecca on 07929 271983, visit the Rainbow Elf website here, or follow her on facebook here.